Heath Ledger singing Franki Valli with a marching band, a baby-faced Joseph Gordon-Levitt and Julia Stiles' teary-eyed monologue -- there are plenty of things to love in 10 Things I Hate About You, making it the perfect cult teen comedy to get the UMPO treatment at Rockwell: Table & Stage. 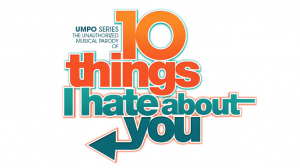 Featuring L.A.-based actors and singers from TV, film and Broadway, UMPO: 10 Things I Hate About You is a cheeky, song-filled parody that'll have you swimming in '90s nostalgia. Directed by Nathan Moore.